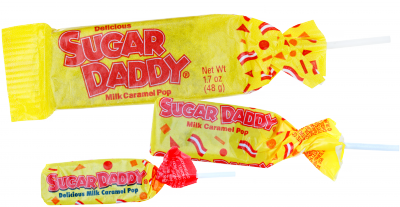 Sugar Daddy: The Perfect, Go-Anywhere Treat! Enjoy satisfying, milk caramel goodness with Sugar Daddy, America's oldest and most popular milk caramel lollipop. The slow-cooked caramel pop, packed in its trademark confetti-adorned, non-stick wax paper wrapper, provides long-lasting, sweet tooth-pleasing comfort, the perfect go-anywhere candy treat. Created in 1925, the portable caramel lollipop was originally called the Papa Sucker, later changing its name in 1932 to suggest “a wealth of sweetness”--hence, Sugar Daddy. 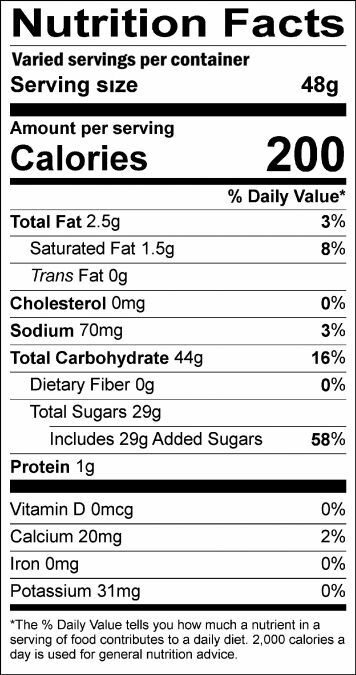 Ingredients: Corn Syrup, Sugar, Palm Oil, Dry Whole Milk, Whey, Natural and Artificial Flavors, Salt, Soy Lecithin.